After a controversial victory at Underground 4, Blaze must defend the Jackson Shield against Kartik. The champ and The Neo Viper face off one-on-one in the main event of Maniacs United Thrills ‘n’ Chills tomorrow. Kartik was poised to retrieve the Jackson Shield and claim victory in a multi-man ladder match at Underground 4 last month before interference from Maniacs United General Manager Cam Corban. With Kartik neutralised by Corban, Blaze climbed the ladder to retain his title. Corban will be in Blaze’s corner again tomorrow night. The General Manager has been surprisingly blasé about Kartik’s chance at revenge. Kartik has remained silent regarding the Thrills ‘n’ Chills main event. 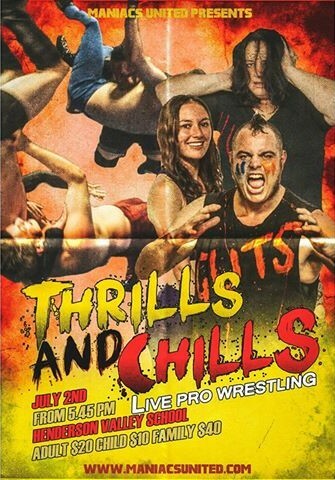 Thrills ‘n’ Chills will play host to at least four other matches, including a bout between Maniacs United regular Curtis Castlewood and relative newcomer Jade Priest. Priest was eager to deliver a warning to Castlewood. Maniacs United Thrills ‘n’ Chills takes place tomorrow, July 2, at Henderson Valley School in Auckland. Doors open at 5.45pm. Tickets are available on the door ($20 for adults, $10 for children). The card, subject to change, is listed below.